As we celebrate the holiday season with friends and family, it's nice to be reminded that wishes really can come true. That is certainly the case with DeeDee the greyhound. Her touching story was posted on YouTube on Christmas eve, and chronicles her journey from racing dog, to adopted friend, to trusted service dog. Please watch her story here, and follow her on the blog Around With the Hound. 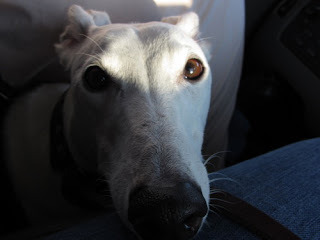 Finally, please consider supporting greyhound adoption by checking out our Adoption Links page. There is no better time to find a new friend! Thank you for sharing DeeDee's story! This is her handler, the gal behind the lens, lol. I am truly and deeply blessed to have such an amazing greyhound. She has made a tremendous difference in my life. 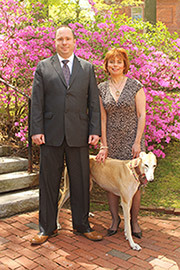 What's more, my hope is that her story will help others see greyhounds in a new light, and that because of her, more greyhounds will be adopted. Thank you for spreading the word and helping make this a reality. Have a wonderful new year!